The Four Noble Truths are at the heart of the Buddha’s teaching. In fact, all subsequent teachings – be they by him or by any other Buddhist teacher – fit somewhere into this fourfold structure. For years, I had presented them in a list, but more recently – especially as I’ve worked to make these ideas clearer to my 6th graders – I’ve been organizing them differently. And, as a result, the students seem to understand the underlying logic and structure of these ideas better than they might have. The Four Noble Truths were the very first teaching the Buddha gave after he awakened under the Bodhi tree. As I mentioned above, they are the foundation for all subsequent teachings, the framework inside of which Buddhist practice takes place. First, dukkha exists. The term dukkha is a Pali word that is often translated as “suffering,” although the range of meaning is broader: it means something closer to distress, unhappiness, dis-ease, dissatisfaction. I usually introduce dukkha as a vocabulary word to students because the new word carries fewer connotations and assumptions than a word like suffering. Second, dukkha has a cause. One cause is craving: for pleasure, for permanence, for things to be other than they actually are. Because of this craving, the Buddha observed, human beings act in ways that cause dukkha for themselves and others. These actions are otherwise known as karma, and this negative karma is a second cause of dukkka. Craving and negative karma are the two proximate causes of dukkha. The ultimate cause, however, is ignorance: an active misunderstanding of the nature of the self and the world in which it lives. Third, dukkha ends. It can end, permanently. This state of cessation – the absence of dukkha and its causes mentioned above­ – is known as nirvana. Fourth, there is a path to nirvana. The path is eight-fold, and has three major sub-divisions: ethical conduct (wise action, wise speech, wise livelihood); meditation (wise mindfulness, wise concentration, wise effort); and wisdom (wise view and wise thought). The word “Right” is sometimes used instead of “wise”; I go back and forth, to be honest, and have not really hit on language I prefer for this important term. 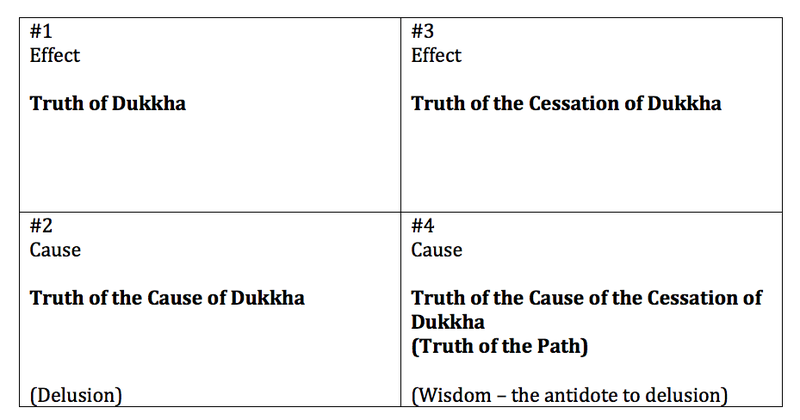 These are often presented in a pithy form: Truth of dukkha; Truth of the cause; Truth of cessation; Truth of the Path. 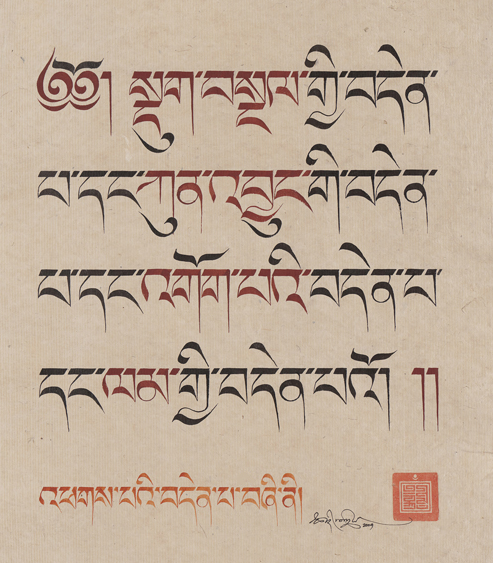 This is what the Tibetan calligraphy above says. I’ve found that students often connect with the ideas presented in the Four Noble Truths to greater or lesser degrees, but they could not always recall the truths in order. This seemed like a gap in their learning (and my teaching). To my mind, there is a logic to the presentation, but I wasn’t able to convey it to the students using the traditional list. And this, I think, is where the benefits of the 2×2 grid (and the renaming) become clear. Students are better able to understand the deep parallel structure of the Four Noble Truths. There’s a connection between the first and the second truths (effect and cause), and a similar one between the third and the fourth truths (effect and cause). Also, the left column and the right column are opposites: the left side is about suffering and how it comes about; the right side is about freedom from suffering and how that comes about. Students also see how the top row has effects and the bottom row has causes. Hence, we’ve got another noble truth. Tell the Math folks (and the Buddha): 2 x 2 > 4 ! * Technically speaking, this phrasing is inaccurate: nirvana is a cessation, and (at least in the Tibetan tradition) cessations cannot be caused. But such scholastic distinctions may not be relevant to my sixth graders. This entry was posted in Buddhism, Lesson Plans and tagged Buddhism, Buddhism lesson plan, dukkha, Four Noble Truths, Four Noble Truths lesson plan, lesson plan, nirvana, teaching by teachingasianreligions. Bookmark the permalink. Welcome to the blog! Thanks for your comment. I will have to dig up the article: the 3+1 schema is a valuable one. I hope to write a post about kama, artha, dharma, and moksha in the next few weeks. Readers: Amod has a great blog that I warmly recommend: loveofallwisdom.com. Check it out! Thanks for the shout-out, Andy! I believe the article is fairly obscure, so I looked up the source in hopes of helping you track it down. It is a 1982 article by Charles Malamoud called “On the rhetoric and semantics of puruṣārtha” (I’d forgotten that it took the puruṣārtha scheme as its focus). It is in a collection called Way of Life: King, Householder, Renouncer, edited by T.N. Madan and published by Vikas Publishing House in New Delhi. Widener had it, but I’m not sure who else does – good luck!